Well it’s good to see that you’ve decided to participate in Robotix 2016. Let’s get you through the event in a few easy steps through this easy to follow DIY. The Sherlock robot is a basic differential drive chassis with a few sensors aboard. The two primary sensors are the HMC5883L magnetic digital compass that can be interfaced with the help of I2C communication protocol and the TSOP1738 IR receiver. Both of these are really common and the basic codes for both of them are pretty easy on a microcontroller like Arduino. Usage of these sensors is fairly simple and more information is available on our tutorial page for Sherlock. What matters most is the code and algorithms that drive your robot! That’s what this tutorial covers. The ‘400’ and ‘500’ are the start and end values of the message respectively. There are 2 pieces of information given by the message. 12 denotes that it is the first of the 2 total messages. 51 is the ID of the start node. 22 denotes that it is the second of the 2 total messages. 2 is the ID of the next node connected to the start, at an absolute heading of 260 degrees wrt north. The cost to the path is 20. In Round 1, all the costs are set to 20 by default. 11 denotes that it is the first of the total 1 message. 2 is the ID of the node, while the information is that the next node is node 5, at heading 120 degrees wrt north. So the robot now has to turn by 140 (260-120) degrees to align itself to that heading and move forward until it encounters node 5. In a similar way, it has to keep moving and following nodes until it reaches the finish point, i.e. node 72. Don’t be overawed by the length. The length would be much much more longer. And don’t be overawed by that too, everything would be handled by the microcontroller! As evident, there are now three pieces of information from this code, from the three pairs of start (400) and stop (500) bits. I’m going to cover the second and third parts first, as they are pretty similar to what was there in Round 1. 23 denotes that it is the second of the 3 total messages. 2 is the ID of the next node connected to the start, at an absolute heading of 220 degrees wrt north. The cost to the path is 20. After this the separator (450) separated numbers denote the nodes and their connections. 2 is connected to 3 and 4. 3 is connected to 2 and 5. 4 is connected to 2, 5 and 6. 5 is connected to 3, 4 and 7. 6 is connected to 4 and 7. 7 is connected to 5, 6 and 8. 8 is connected to 7, 9 and 72. Which means that the node 2 is connected to 3 and 4 at headings of 150 degrees and 100 degrees and via paths of costs of 10 and 15 respectively. As you can appreciate, we can write a simple code to traverse such a graph. The information stored in Sherlock would mostly be in the form of an adjacency list, and BFS can be modified slightly to give our results in a O(nlog(n)) time complexity. 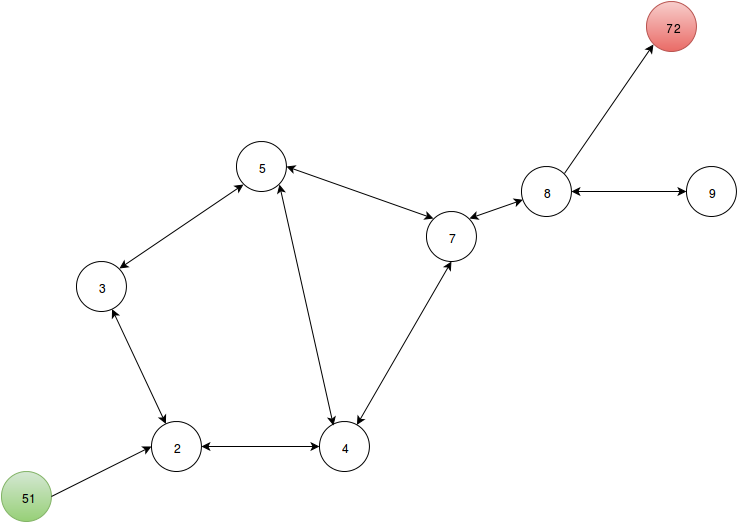 Another algorithm used to search graphs is depth first search (DFS), but it is not used to calculate shortest paths as the result may or may not be correct. Speed depends on type and shape of graph. If the graph bifurcates too many times, BFS may be quite slow, and DFS may cruise through to the end point. DFS is suitable to be used if the robot actually has to move to the end vertex without knowing the graph. Since all the motion to the end is happening in the code itself, we’d prefer an algorithm that gives us the correct answer. Djikstra’s algorithm, just like breadth first search traverses all neighbours of visited nodes and marks them visited, while keeping count of the minimum cost required to reach that node. It returns information for the minimum cost required to reach any node from the start point. It is simply a modification of BFS and hence the pseudocode is easy to understand. As you can see, this pseudocode accounts for cyclic loops too, as it updates the node weights if it traversed the node again, and our event requires the same. Here we attach a pseudocode for the A star algorithm, without explanation. Here’s the link. So far so good. But as it may be evident, we have two main problems that YOU have to tackle to make a successful robot for event Sherlock. While doing so, it must not eat up the tiny memory of the Arduino! Yes, the second problem is something you might not have thought of, and is a major one. One recommendation would be to use an Arduino Mega over an Uno, but a recursive code might even eat up a Mega’s memory. Well written iterative codes would work good both on Uno and Mega, with Mega having more margin for error. The Uno has 2 kilobytes of SRAM and the mega, 8 kilobytes. Considering 2 byte ints, it wouldn’t take too long to fill up, and recursive functions would fail almost definitely. Another solution would be to use the Flash memory, the Uno has 32kb, while the Mega has a nice 256 kilobytes! The flash memory is best for data that is constant and does not need to be modified further. For example, our graph array or list can be safely stored in the flash memory without worries. For usage of the Flash memory on Arduino, check out this link. The first part is where the essence of the event lies. The robot initially does not know anything about the edge costs. The robot initially would take a biquadratic equation and keep constructing simultaneous equations until they become 5 in number. Now the robot would know the edge costs as well, and hence after that the robot will come to know the entire graph with the edge costs as well. Now after that it is simply a Djikstra’s algorithm problem which can be solved with ease. Using the iterative code, the robot can find the minimum cost path in seconds and then follow the headings to reach the end point. So here’s to flaunt your algorithmic skills and be the eventual champion of Sherlock, Robotix 2016!